A new bill introduced in U.S. Congress today by representatives Ted Lieu (D-CA) and Blake Farenthold (R-TX) would attempt to block state-level efforts to ban sales of strongly encrypted smartphones, reports Ars Technica. The federal bill will need to pass the U.S. House of Representatives and Senate, and be signed by the president, in order to become law. If passed quick enough, the bipartisan legislation would set precedent over state-level bills. California and New York assemblymen have introduced new bills over the past year that would require smartphone manufacturers like Apple and Google to create devices that can be decrypted or unlocked, or be subject to fines. The virtually identical bills would require any smartphone manufactured after January 1, 2017 and sold in New York or California to "be capable of being decrypted and unlocked by its manufacturer or its operating system provider." Apple and others would face a $2,500 fine per phone in violation of the proposed law. Apple is strongly against government efforts to weaken smartphone encryption. 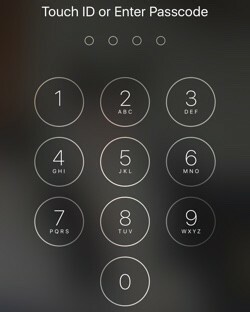 The company ceased storing encryption keys for devices on iOS 8, making it impossible for the iPhone maker to unlock content on passcode-protected devices under police request. Both iOS and Android share these default encryption settings. In September, FBI Director James Comey expressed concerns that Apple and Google are "marketing something expressly to allow people to place themselves above the law." Meanwhile, Apple CEO Tim Cook believes providing the U.S. government with back door access means the "back door's for everybody, for good guys and bad guys." Read the full text of the "ENCRYPT Act of 2016" for more details about the new house bill. Good to see there are still a few sane bodies in Washington. Thank goodness someone is stepping up to stop the madness. In September, FBI Director James Comey expressed concerns ('https://www.macrumors.com/2014/09/25/rbi-concerned-with-apple-encryption/') that Apple and Google are "marketing something expressly to allow people to place themselves above the law." That's one pretty ****ed up statement. Am I obligated by the law (whatever the hell that is) to hand my privacy? What a time to be alive. Imagine the citizens of the USA being able to have the right to privacy! I think these people forget who they work for. Not to mention he's too stupid to realize that even if Apple put in a back door, the criminals could add their own additional encryption for which there would be no backdoor. Good to see this come up as a bipartisan bill. Hopefully it passes and Obama is willing to sign it. After Snowden leaks, the masks are gone, aren't they ? Governments can no longer hide their true face on spying matters. What they did secretly till then, now they ask for it openly. Since when has having privacy become "placing yourself above the law?" In September, FBI Director James Comedy expressed concerns ('https://www.macrumors.com/2014/09/25/rbi-concerned-with-apple-encryption/') that Apple and Google are "marketing something expressly to allow people to place themselves above the law." Since we aren't all criminals, no, we are not placing ourselves above the law. However, the FBI is by implying that the well established right to privacy in this country for innocent people doesn't exist. Lol at Comey and his ilk thinking he's a good guy. I suppose when the NSA lied to congress it was for good too? These are the folks who think they are above the law. They must keep the fear agenda going. Apple do not want the Government to decrypt our phones but Apple can render them useless if we get them fix by a third party. 2) deconstructing your statement, in both instances, Apple's actions are to protect user information. So Apple is still being consistent in its effort to safeguard user data.